I'll be the first to admit that I'm not a particularly big fan of sports, animated or otherwise. Fortunately, you don't have to be in order to enjoy Big Windup, a well crafted series about a high school's all-freshman baseball team. The story of Big Windup primarily follows the meek and introverted Ren Mihashi, the pitcher for a middle school team that lost virtually every game they played for three straight years. Hated by his previous teammates and completely lacking in confidence, Ren decided that it would be best to give up baseball and start over again at a new school. Much to his chagrin, he finds himself unwittingly added to the roster of the newly-formed Nishiura High baseball team, dragged along in the wake of its force-of-nature female coach, Momoe. Well, it wouldn't be much of a show if Ren didn't end up playing baseball one way or another so none of that comes as any surprise. Where the series does surprise me, however, is in its handling and execution. Big Windup is unique among sports anime in that it takes the subject matter seriously and handles it in a relatively realistic fashion. You won't find any pitches that turn into bolts of lightning or seven foot tall super-sluggers taking the plate in this series. What you will find is more strikeouts than hits, innings where zero runs are scored, and hits that are nothing more than fly-balls for an immediate out. This realism also extends to the cast of characters. Nishiura High may have only just formed its baseball team but it hasn't formed it from the usual underdog, sandlot crew of anime clichÃ©s that would otherwise have nothing to do with one another. Rather, the team is comprised of freshmen that have been playing baseball for most of their lives and are talented accordingly. If this makes the series sound boring, I can assure you that it's not. While the cast seems lackluster at a glance, most of the characters themselves actually come across quite well through interactions and emotions that all feel natural. Yes, there is a hotheaded character but he isn't hotheaded enough to be the archetypal idiot you anticipate. Yes, there is also an extremely energetic loudmouth, but he isn't energetic enough to become an obnoxious caricature of a human being and that, right there, is the key to the entire series. At all times, Big Windup appears to know when to draw the line between a character and a caricature. The exception to the above rule comes in the form of Ren himself. Being as meek and introverted as he is, he rarely ever speaks. Instead, much of his expression comes from his extreme body language and almost disturbingly expressive face. Given that none of the other characters share Ren's particular brand of super deformed visuals, it functions as a surrogate language surprisingly well. The catcher, Abe, is also frequently on hand to shake a few words out of Ren should it prove to be necessary. Abe shares much of Ren's spotlight and the pair easily shows the most growth over the course of this first season. The former is a catcher that hates pitchers, and the latter is a pitcher terrified that his catcher will hate him. Finding a middle ground where the pair can operate together as a cohesive battery is a difficult task indeed. While most of the time outside of baseball games is spent following Ren rather than Abe, the situation inverts once they hit the field. We spend a great deal of time inside the talented catcher's head as he dissects the individual batters in an effort to determine how best to utilize Ren's unique pitching skills. 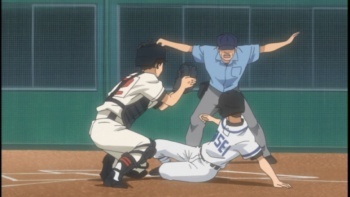 Rather than negatively influencing a scene's pacing, these analytical moments actually serve to enhance it while putting an interesting slant on the game beyond the typical "pitcher wins the game by himself" formula inherent in many other sports anime. I'm genuinely hard pressed to find negative things to say about Big Windup. It could use a few more off-the-field episodes and you can't expect a clean ending as the series clearly continues onward into a second season, but that's about the extent of it. The visual style is simple but incredibly well animated, the soundtrack suits the series, the writing is surprisingly good, and I was able to watch 26 dubbed episodes without batting an eye. Bottom Line: It's a show that takes its subject sport seriously without losing sight of the simple fact that a TV series is meant to entertain the viewer. It can be enjoyed whether you're a sports fan or not and the English dub is just as good as the original Japanese. Recommendation: It's worth a watch if you have even the remotest interest in baseball and very likely worth a watch even if you don't. James Henley honestly found Big Windup! to be more entertaining than any real baseball game he's watched.